For the video game, see Halley's Comet (video game). Halley's Comet or Comet Halley, officially designated 1P/Halley, is a short-period comet visible from Earth every 75–76 years. Halley last appeared in the inner parts of the Solar System in 1986 and will next appear in mid-2061. Halley's returns to the inner Solar System have been observed and recorded by astronomers since at least 240 BC. Clear records of the comet's appearances were made by Chinese, Babylonian, and medieval European chroniclers, but were not recognized as reappearances of the same object at the time. The comet's periodicity was first determined in 1705 by English astronomer Edmond Halley, after whom it is now named. During its 1986 apparition, Halley's Comet became the first comet to be observed in detail by spacecraft, providing the first observational data on the structure of a comet nucleus and the mechanism of coma and tail formation. These observations supported a number of longstanding hypotheses about comet construction, particularly Fred Whipple's "dirty snowball" model, which correctly predicted that Halley would be composed of a mixture of volatile ices—such as water, carbon dioxide, and ammonia—and dust. The missions also provided data that substantially reformed and reconfigured these ideas; for instance, it is now understood that the surface of Halley is largely composed of dusty, non-volatile materials, and that only a small portion of it is icy. Comet Halley is commonly pronounced /ˈhæli/, rhyming with valley, or /ˈheɪli/, rhyming with daily. Colin Ronan, one of Edmond Halley's biographers, preferred /ˈhɔːli/ (HAW-lee, similar to holly). Spellings of Halley's name during his lifetime included Hailey, Haley, Hayley, Halley, Hawley, and Hawly, so its contemporary pronunciation is uncertain, but contemporary individuals with this last name appear to prefer the version that rhymes with "valley". Halley was the first comet to be recognized as periodic. Until the Renaissance, the philosophical consensus on the nature of comets, promoted by Aristotle, was that they were disturbances in Earth's atmosphere. This idea was disproved in 1577 by Tycho Brahe, who used parallax measurements to show that comets must lie beyond the Moon. Many were still unconvinced that comets orbited the Sun, and assumed instead that they must follow straight paths through the Solar System. In 1687, Sir Isaac Newton published his Philosophiæ Naturalis Principia Mathematica, in which he outlined his laws of gravity and motion. His work on comets was decidedly incomplete. Although he had suspected that two comets that had appeared in succession in 1680 and 1681 were the same comet before and after passing behind the Sun (he was later found to be correct; see Newton's Comet), he was unable to completely reconcile comets into his model. Ultimately, it was Newton's friend, editor and publisher, Edmond Halley, who, in his 1705 Synopsis of the Astronomy of Comets, used Newton's new laws to calculate the gravitational effects of Jupiter and Saturn on cometary orbits. Having compiled a list of 24 comet observations, he calculated that the orbital elements of a second comet that had appeared in 1682 were nearly the same as those of two comets that had appeared in 1531 (observed by Petrus Apianus) and 1607 (observed by Johannes Kepler). Halley thus concluded that all three comets were, in fact, the same object returning about every 76 years, a period that has since been found to vary between 74–79 years. After a rough estimate of the perturbations the comet would sustain from the gravitational attraction of the planets, he predicted its return for 1758. While he had personally observed the comet around perihelion in September 1682, Halley died in 1742 before he could observe its predicted return. Halley's prediction of the comet's return proved to be correct, although it was not seen until 25 December 1758, by Johann Georg Palitzsch, a German farmer and amateur astronomer. It did not pass through its perihelion until 13 March 1759, the attraction of Jupiter and Saturn having caused a retardation of 618 days. This effect was computed prior to its return (with a one-month error to 13 April) by a team of three French mathematicians, Alexis Clairaut, Joseph Lalande, and Nicole-Reine Lepaute. The confirmation of the comet's return was the first time anything other than planets had been shown to orbit the Sun. It was also one of the earliest successful tests of Newtonian physics, and a clear demonstration of its explanatory power. The comet was first named in Halley's honour by French astronomer Nicolas-Louis de Lacaille in 1759. Some scholars have proposed that first-century Mesopotamian astronomers already had recognized Halley's Comet as periodic. This theory notes a passage in the Bavli Talmud that refers to "a star which appears once in seventy years that makes the captains of the ships err." Researchers in 1981 attempting to calculate the past orbits of Halley by numerical integration starting from accurate observations in the seventeenth and eighteenth centuries could not produce accurate results further back than 837 due to a close approach to Earth in that year. It was necessary to use ancient Chinese comet observations to constrain their calculations. The orbital path of Halley, against the orbits of Jupiter, Saturn, Uranus and Neptune. Halley's orbital period has varied between 74–79 years since 240 BC. Its orbit around the Sun is highly elliptical, with an orbital eccentricity of 0.967 (with 0 being a circle and 1 being a parabolic trajectory). The perihelion, the point in the comet's orbit when it is nearest the Sun, is just 0.6 AU. This is between the orbits of Mercury and Venus. Its aphelion, or farthest distance from the Sun, is 35 AU (roughly the distance of Pluto). Unusual for an object in the Solar System, Halley's orbit is retrograde; it orbits the Sun in the opposite direction to the planets, or, clockwise from above the Sun's north pole. The orbit is inclined by 18° to the ecliptic, with much of it lying south of the ecliptic. (Because it is retrograde, the true inclination is 162°.) Due to the retrograde orbit, it has one of the highest velocities relative to the Earth of any object in the Solar System. The 1910 passage was at a relative velocity of 70.56 km/s (157,838 mph or 254,016 km/h). Because its orbit comes close to Earth's in two places, Halley is associated with two meteor showers: the Eta Aquariids in early May, and the Orionids in late October. Halley is the parent body to the Orionids. Observations conducted around the time of Halley's appearance in 1986 suggested that the comet could additionally perturb the Eta Aquariids meteor shower, although it might not be the parent of that shower. Halley is classified as a periodic or short-period comet; one with an orbit lasting 200 years or less. This contrasts it with long-period comets, whose orbits last for thousands of years. Periodic comets have an average inclination to the ecliptic of only ten degrees, and an orbital period of just 6.5 years, so Halley's orbit is atypical. Most short-period comets (those with orbital periods shorter than 20 years and inclinations of 20–30 degrees or less) are called Jupiter-family comets. Those resembling Halley, with orbital periods of between 20 and 200 years and inclinations extending from zero to more than 90 degrees, are called Halley-type comets. As of 2015[update], only 75 Halley-type comets have been observed, compared with 511 identified Jupiter-family comets. The orbits of the Halley-type comets suggest that they were originally long-period comets whose orbits were perturbed by the gravity of the giant planets and directed into the inner Solar System. If Halley was once a long-period comet, it is likely to have originated in the Oort cloud, a sphere of cometary bodies that has an inner edge of 20,000–50,000 AU. Conversely the Jupiter-family comets are generally believed to originate in the Kuiper belt, a flat disc of icy debris between 30 AU (Neptune's orbit) and 50 AU from the Sun (in the scattered disc). Another point of origin for the Halley-type comets was proposed in 2008, when a trans-Neptunian object with a retrograde orbit similar to Halley's was discovered, 2008 KV42, whose orbit takes it from just outside that of Uranus to twice the distance of Pluto. It may be a member of a new population of small Solar System bodies that serves as the source of Halley-type comets. Halley has probably been in its current orbit for 16,000–200,000 years, although it is not possible to numerically integrate its orbit for more than a few tens of apparitions, and close approaches before 837 AD can only be verified from recorded observations. The non-gravitational effects can be crucial; as Halley approaches the Sun, it expels jets of sublimating gas from its surface, which knock it very slightly off its orbital path. These orbital changes cause delays in its perihelion of four days, average. In 1989, Boris Chirikov and Vitaly Vecheslavov performed an analysis of 46 apparitions of Halley's Comet taken from historical records and computer simulations. These studies showed that its dynamics were chaotic and unpredictable on long timescales. Halley's projected lifetime could be as long as 10 million years. These studies also showed that many physical properties of Halley's Comet dynamics can be approximately described by a simple symplectic map, known as the Kepler map. More recent work suggests that Halley will evaporate, or split in two, within the next few tens of thousands of years, or will be ejected from the Solar System within a few hundred thousand years. Observations by D.W. Hughes suggest that Halley's nucleus has been reduced in mass by 80 to 90% over the last 2,000 to 3,000 revolutions. The nucleus of Halley's Comet, imaged by the Giotto probe in 1986. The dark coloration of the nucleus can be observed, as well as the jets of dust and gas erupting from its surface. The Giotto and Vega missions gave planetary scientists their first view of Halley's surface and structure. Like all comets, as Halley nears the Sun, its volatile compounds (those with low boiling points, such as water, carbon monoxide, carbon dioxide and other ices) begin to sublimate from the surface of its nucleus. This causes the comet to develop a coma, or atmosphere, up to 100,000 km across. Evaporation of this dirty ice releases dust particles, which travel with the gas away from the nucleus. Gas molecules in the coma absorb solar light and then re-radiate it at different wavelengths, a phenomenon known as fluorescence, whereas dust particles scatter the solar light. Both processes are responsible for making the coma visible. As a fraction of the gas molecules in the coma are ionized by the solar ultraviolet radiation, pressure from the solar wind, a stream of charged particles emitted by the Sun, pulls the coma's ions out into a long tail, which may extend more than 100 million kilometres into space. Changes in the flow of the solar wind can cause disconnection events, in which the tail completely breaks off from the nucleus. Despite the vast size of its coma, Halley's nucleus is relatively small: barely 15 kilometres long, 8 kilometres wide and perhaps 8 kilometres thick. [b] Its shape vaguely resembles that of a peanut. Its mass is relatively low (roughly 2.2 × 1014 kg) and its average density is about 0.6 g/cm3, indicating that it is made of a large number of small pieces, held together very loosely, forming a structure known as a rubble pile. Ground-based observations of coma brightness suggested that Halley's rotation period was about 7.4 days. Images taken by the various spacecraft, along with observations of the jets and shell, suggested a period of 52 hours. Given the irregular shape of the nucleus, Halley's rotation is likely to be complex. Although only 25% of Halley's surface was imaged in detail during the flyby missions, the images revealed an extremely varied topography, with hills, mountains, ridges, depressions, and at least one crater. Halley is the most active of all the periodic comets, with others, such as Comet Encke and Comet Holmes, being one or two orders of magnitude less active. Its day side (the side facing the Sun) is far more active than the night side. Spacecraft observations showed that the gases ejected from the nucleus were 80% water vapour, 17% carbon monoxide and 3–4% carbon dioxide, with traces of hydrocarbons although more-recent sources give a value of 10% for carbon monoxide and also include traces of methane and ammonia. The dust particles were found to be primarily a mixture of carbon–hydrogen–oxygen–nitrogen (CHON) compounds common in the outer Solar System, and silicates, such as are found in terrestrial rocks. The dust particles decreased in size down to the limits of detection (~0.001 µm). The ratio of deuterium to hydrogen in the water released by Halley was initially thought to be similar to that found in Earth's ocean water, suggesting that Halley-type comets may have delivered water to Earth in the distant past. Subsequent observations showed Halley's deuterium ratio to be far higher than that found in Earth's oceans, making such comets unlikely sources for Earth's water. Giotto provided the first evidence in support of Fred Whipple's "dirty snowball" hypothesis for comet construction; Whipple postulated that comets are icy objects warmed by the Sun as they approach the inner Solar System, causing ices on their surfaces to sublimate (change directly from a solid to a gas), and jets of volatile material to burst outward, creating the coma. Giotto showed that this model was broadly correct, though with modifications. Halley's albedo, for instance, is about 4%, meaning that it reflects only 4% of the sunlight hitting it; about what one would expect for coal. Thus, despite appearing brilliant white to observers on Earth, Halley's Comet is in fact pitch black. The surface temperature of evaporating "dirty ice" ranges from 170 K (−103 °C) at higher albedo to 220 K (−53 °C) at low albedo; Vega 1 found Halley's surface temperature to be in the range 300–400 K (27–127 °C). This suggested that only 10% of Halley's surface was active, and that large portions of it were coated in a layer of dark dust that retained heat. Together, these observations suggested that Halley was in fact predominantly composed of non-volatile materials, and thus more closely resembled a "snowy dirtball" than a "dirty snowball". Halley may have been recorded as early as 467 BC, but this is uncertain. A comet was recorded in ancient Greece between 468 and 466 BC; its timing, location, duration, and associated meteor shower all suggest it was Halley. According to Pliny the Elder, that same year a meteorite fell in the town of Aegospotami, in Thrace. He described it as brown in colour and the size of a wagon load. Chinese chroniclers also mention a comet in that year. The first certain appearance of Halley's Comet in the historical record is a description from 240 BC, in the Chinese chronicle Records of the Grand Historian or Shiji, which describes a comet that appeared in the east and moved north. The only surviving record of the 164 BC apparition is found on two fragmentary Babylonian tablets, now owned by the British Museum. The apparition of 87 BC was recorded in Babylonian tablets which state that the comet was seen "day beyond day" for a month. This appearance may be recalled in the representation of Tigranes the Great, an Armenian king who is depicted on coins with a crown that features, according to Vahe Gurzadyan and R. Vardanyan, "a star with a curved tail [that] may represent the passage of Halley's Comet in 87 BC." Gurzadyan and Vardanyan argue that "Tigranes could have seen Halley's Comet when it passed closest to the Sun on August 6 in 87 BC" as the comet would have been a "most recordable event"; for ancient Armenians it could have heralded the New Era of the brilliant King of Kings. The apparition of 12 BC was recorded in the Book of Han by Chinese astronomers of the Han Dynasty who tracked it from August through October. It passed within 0.16 AU of Earth. According to the Roman historian Cassius Dio, a comet appeared suspended over Rome for several days portending the death of Marcus Vipsanius Agrippa in that year. Halley's appearance in 12 BC, only a few years distant from the conventionally assigned date of the birth of Jesus Christ, has led some theologians and astronomers to suggest that it might explain the biblical story of the Star of Bethlehem. There are other explanations for the phenomenon, such as planetary conjunctions, and there are also records of other comets that appeared closer to the date of Jesus' birth. If, as has been suggested, the reference in the Talmud to "a star which appears once in seventy years that makes the captains of the ships err" (see above) refers to Halley's Comet, it may be a reference to the 66 AD appearance, because this passage is attributed to the Rabbi Yehoshua ben Hananiah. This apparition was the only one to occur during ben Hananiah's lifetime. The 141 AD apparition was recorded in Chinese chronicles. It was also recorded in the Tamil work Purananuru, in connection with the death of the south Indian Chera king Yanaikatchai Mantaran Cheral Irumporai. The 374 AD and 607 approaches each came within 0.09 AU of Earth. The 684 AD apparition was recorded in Europe in one of the sources used by the compiler of the 1493 Nuremberg Chronicles; it is the oldest-known picture of a comet. Chinese records also report it as the "broom star". The 451 AD apparition was said to herald the defeat of Attila the Hun at the Battle of Chalons. In 837, Halley's Comet may have passed as close as 0.03 AU (3.2 million miles; 5.1 million kilometres) from Earth, by far its closest approach. Its tail may have stretched 60 degrees across the sky. It was recorded by astronomers in China, Japan, Germany, the Byzantine Empire, and the Middle East. In 912, Halley is recorded in the Annals of Ulster, which state "A dark and rainy year. A comet appeared." In 1066, the comet was seen in England and thought to be an omen: later that year Harold II of England died at the Battle of Hastings; it was a bad omen for Harold, but a good omen for the man who defeated him, William the Conqueror. The comet is represented on the Bayeux Tapestry and described in the tituli as a star. Surviving accounts from the period describe it as appearing to be four times the size of Venus and shining with a light equal to a quarter of that of the Moon. Halley came within 0.10 AU of Earth at that time. This appearance of the comet is also noted in the Anglo-Saxon Chronicle. Eilmer of Malmesbury may have seen Halley previously in 989, as he wrote of it in 1066: "You've come, have you? ... You've come, you source of tears to many mothers, you evil. I hate you! It is long since I saw you; but as I see you now you are much more terrible, for I see you brandishing the downfall of my country. I hate you!" The Irish Annals of the Four Masters recorded the comet as "A star [that] appeared on the seventh of the Calends of May, on Tuesday after Little Easter, than whose light the brilliance or light of The Moon was not greater; and it was visible to all in this manner till the end of four nights afterwards." Chaco Native Americans in New Mexico may have recorded the 1066 apparition in their petroglyphs. The Adoration of the Magi (circa 1305) by Giotto, who purportedly modeled the star of Bethlehem on Halley, which had been sighted 4 years prior to this painting. The 1145 apparition was recorded by the monk Eadwine. The 1986 apparition exhibited a fan tail similar to Eadwine's drawing. Some claim that Genghis Khan was inspired to turn his conquests toward Europe by the 1222 apparition. 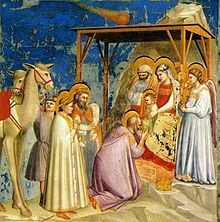 The 1301 apparition may have been seen by the artist Giotto di Bondone, who represented the Star of Bethlehem as a fire-colored comet in the Nativity section of his Arena Chapel cycle, completed in 1305. Its 1378 appearance is recorded in the Annales Mediolanenses as well as in East Asian sources. A hairy and fiery star having then made its appearance for several days, the mathematicians declared that there would follow grievous pestilence, dearth and some great calamity. Calixtus, to avert the wrath of God, ordered supplications that if evils were impending for the human race He would turn all upon the Turks, the enemies of the Christian name. He likewise ordered, to move God by continual entreaty, that notice should be given by the bells to call the faithful at midday to aid by their prayers those engaged in battle with the Turk. Platina's account is not mentioned in official records. In the 18th century, a Frenchman further embellished the story, in anger at the Church, by claiming that the Pope had "excommunicated" the comet, though this story was most likely his own invention. Halley's apparition of 1456 was also witnessed in Kashmir and depicted in great detail by Śrīvara, a Sanskrit poet and biographer to the Sultans of Kashmir. He read the apparition as a cometary portent of doom foreshadowing the imminent fall of Sultan Zayn al-Abidin (AD 1418/1420–1470). After witnessing a bright light in the sky which most historians have identified as Halley's Comet, Zara Yaqob, Emperor of Ethiopia from 1434 to 1468, founded the city of Debre Berhan (tr. City of Light) and made it his capital for the remainder of his reign. Halley's periodic returns have been subject to scientific investigation since the 16th century. The three apparitions from 1531 to 1682 were noted by Edmond Halley, enabling him to predict its 1759 return. Streams of vapour observed during the comet's 1835 apparition prompted astronomer Friedrich Wilhelm Bessel to propose that the jet forces of evaporating material could be great enough to significantly alter a comet's orbit. The 1910 approach, which came into naked-eye view around 10 April and came to perihelion on 20 April, was notable for several reasons: it was the first approach of which photographs exist, and the first for which spectroscopic data were obtained. Furthermore, the comet made a relatively close approach of 0.15 AU, making it a spectacular sight. Indeed, on 19 May, Earth actually passed through the tail of the comet. One of the substances discovered in the tail by spectroscopic analysis was the toxic gas cyanogen, which led astronomer Camille Flammarion to claim that, when Earth passed through the tail, the gas "would impregnate the atmosphere and possibly snuff out all life on the planet." His pronouncement led to panicked buying of gas masks and quack "anti-comet pills" and "anti-comet umbrellas" by the public. In reality, as other astronomers were quick to point out, the gas is so diffuse that the world suffered no ill effects from the passage through the tail. The people believe that it indicates calamity such as war, fire, pestilence, and a change of dynasty. In some places on certain days the doors were unopened for half a day, no water was carried and many did not even drink water as it was rumoured that pestilential vapour was being poured down upon the earth from the comet." The 1910 visitation is also recorded as being the travelling companion of Hedley Churchward, the first known English Muslim to make the Haj pilgrimage to Mecca. However, his explanation of its scientific predictability did not meet with favour in the Holy City. The comet was also fertile ground for hoaxes. One that reached major newspapers claimed that the Sacred Followers, a supposed Oklahoma religious group, attempted to sacrifice a virgin to ward off the impending disaster, but were stopped by the police. Twain died on 21 April 1910, the day following the comet's subsequent perihelion. The 1985 fantasy film The Adventures of Mark Twain was inspired by the quotation. 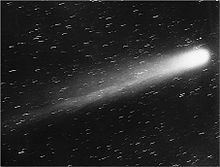 Halley's 1910 apparition is distinct from the Great Daylight Comet of 1910, which surpassed Halley in brilliance and was actually visible in broad daylight for a short period, approximately four months before Halley made its appearance. Halley's 1986 apparition was the least favourable on record. The comet and Earth were on opposite sides of the Sun in February 1986, creating the worst viewing circumstances for Earth observers for the last 2,000 years. Halley's closest approach was 0.42 AU. Additionally, with increased light pollution from urbanization, many people failed to even see the comet. It was possible to observe it in areas outside of cities with the help of binoculars. Further, the comet appeared brightest when it was almost invisible from the northern hemisphere in March and April. Halley's approach was first detected by astronomers David Jewitt and G. Edward Danielson on 16 October 1982 using the 5.1 m Hale telescope at Mount Palomar and a CCD camera. The first person to visually observe the comet on its 1986 return was amateur astronomer Stephen James O'Meara on 24 January 1985. O'Meara used a home-built 24-inch telescope on top of Mauna Kea to detect the magnitude 19.6 comet. On 8 November 1985, Stephen Edberg (then serving as the Coordinator for Amateur Observations at NASA's Jet Propulsion Laboratory) and Charles Morris were the first to observe Halley's Comet with the naked eye in its 1986 apparition. 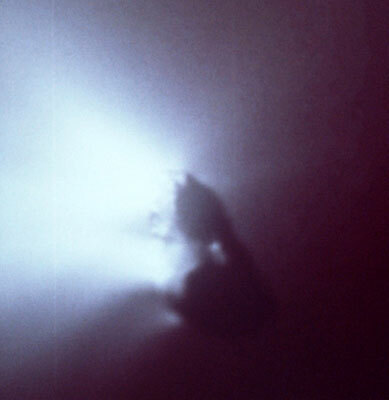 Although Halley's Comet's retrograde orbit and high inclination make it difficult to send a space probe to it, the 1986 apparition gave scientists the opportunity to closely study the comet, and several probes were launched to do so. The Soviet Vega 1 started returning images of Halley on 4 March 1986, and the first ever of its nucleus, and made its flyby on 6 March, followed by Vega 2 making its flyby on 9 March. On 14 March, the Giotto space probe, launched by the European Space Agency, made the closest pass of the comet's nucleus. There were also two Japanese probes, Suisei and Sakigake. The probes were unofficially known as the Halley Armada. Based on data retrieved by Astron, the largest ultraviolet space telescope of the time, during its Halley's Comet observations in December 1985, a group of Soviet scientists developed a model of the comet's coma. The comet was also observed from space by the International Cometary Explorer (ICE). Originally International Sun-Earth Explorer 3, the probe was renamed and freed from its L1 Lagrangian point location in Earth's orbit to intercept comets 21P/Giacobini-Zinner and Halley. ICE made its closest approach on March 28, 1986. Two Space Shuttle missions—the ill-fated STS-51-L (ended by the Challenger disaster) and STS-61-E—were scheduled to observe Halley's Comet from low Earth orbit. STS-51-L carried the Shuttle-Pointed Tool for Astronomy (SPARTAN-203) satellite, also called the Halley's Comet Experiment Deployable (HCED). STS-61-E was a Columbia mission scheduled for March 1986, carrying the ASTRO-1 platform to study the comet. Due to the suspension of America's manned space program after the Challenger explosion, the mission was canceled, and ASTRO-1 would not fly until late 1990 on STS-35. 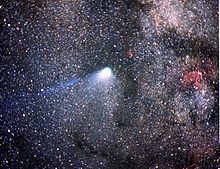 On 12 February 1991, at a distance of 14.4 AU (2.15×109 km) from the Sun, Halley displayed an outburst that lasted for several months, releasing a cloud of dust 300,000 km across. The outburst likely started in December 1990, and then the comet brightened from magnitude 24.3 to magnitude 18.9. Halley was most recently observed in 2003 by three of the Very Large Telescopes at Paranal, Chile, when Halley's magnitude was 28.2. The telescopes observed Halley, at the faintest and farthest any comet has ever been imaged, in order to verify a method for finding very faint trans-Neptunian objects. Astronomers are now able to observe the comet at any point in its orbit. The next predicted perihelion of Halley's Comet is 28 July 2061, when it is expected to be better positioned for observation than during the 1985–1986 apparition, as it will be on the same side of the Sun as Earth. It is expected to have an apparent magnitude of −0.3, compared with only +2.1 for the 1986 apparition. It has been calculated that on 9 September 2060, Halley will pass within 0.98 AU (147,000,000 km) of Jupiter, and then on 20 August 2061 will pass within 0.0543 AU (8,120,000 km) of Venus. In 2134, Halley is expected to pass within 0.09 AU (13,000,000 km) of Earth. Its apparent magnitude is expected to be −2.0. Halley's calculations enabled the comet's earlier appearances to be found in the historical record. The following table sets out the astronomical designations for every apparition of Halley's Comet from 240 BC, the earliest documented widespread sighting. For example, "1P/1982 U1, 1986 III, 1982i" indicates that for the perihelion in 1986, Halley was the first period comet known (designated 1P) and this apparition was the first seen in half-month U (the second half of October) in 1982 (giving 1P/1982 U1); it was the third comet past perihelion in 1986 (1986 III); and it was the ninth comet spotted in 1982 (provisional designation 1982i). The perihelion dates of each apparition are shown. The perihelion dates farther from the present are approximate, mainly because of uncertainties in the modelling of non-gravitational effects. Perihelion dates of 1531 and earlier are in the Julian calendar, while perihelion dates 1607 and after are in the Gregorian calendar. Halley's Comet is visible from Earth every 74–79 years. 1P/−239 K1, −239 240 BC – 15 May 15 – 25 May First confirmed sighting. 1P/−163 U1, −163 164 BC 76 20 May Seen by Babylonians. 1P/−86 Q1, −86 87 BC 77 15 August 6 – 19 August Seen by the Babylonians and Chinese. 1P/−11 Q1, −11 12 BC 75 8 October August – 10 October 0.16 AU Watched by Chinese for two months. 1P/66 B1, 66 66 78 26 January 25 – 26 January May be the comet described in Josephus's The Jewish War as 'A comet of the kind called Xiphias, because their tails appear to represent the blade of a sword' that supposedly heralded the destruction of the Second Temple in 70 AD. 1P/141 F1, 141 141 75 25 March 22 – 25 March Described by the Chinese as bluish-white in colour. Described in Tamil literature and death of Chera (Yanaikatchai Mantaran Cheral Irumporai) king after appearance of comet. 1P/218 H1, 218 218 77 6 April 6 April – 17 May Described by the Roman historian Dion Cassius as 'a very fearful star' . 1P/295 J1, 295 295 77 7 April 7 – 20 April Seen in China, but not spectacular. 1P/374 E1, 374 374 79 13 February 13 – 16 February 0.09 AU Comet passed 13.5 million kilometres from Earth. 1P/451 L1, 451 451 77 3 July 28 June – 3 July Appeared before the defeat of Attila the Hun at the Battle of Chalons. 1P/530 Q1, 530 530 79 15 November 27 September – 15 November Noted in China and Europe, but not spectacular. 1P/607 H1, 607 607 77 26 March 15 – 26 March 0.09 AU Comet passed 13.5 million kilometres from Earth. 1P/684 R1, 684 684 77 26 November 2 October – 26 November First known Japanese records of the comet. Seen in Europe and depicted 800 years later in the Nuremberg Chronicle. Attempts have been made to connect an ancient Maya depiction of God L to the event. 1P/760 K1, 760 760 76 10 June 20 May – 10 June Seen in China, at the same time as another comet. 1P/837 F1, 837 837 77 25 February 25 – 28 February 0.03 AU Closest-ever approach to the Earth (5 million km). Tail stretched halfway across the sky. Appeared as bright as Venus. 1P/912 J1, 912 912 75 27 July 18 – 27 July Seen briefly in China and Japan. 1P/989 N1, 989 989 77 2 September 2 – 5 September Seen in China, Japan, and (possibly) Korea. 1P/1066 G1, 1066 1066 77 25 March January – 25 March 0.10 AU Seen for over two months in China. Recorded in England and depicted on the later Bayeux tapestry which portrayed the events of that year. 1P/1145 G1, 1145 1145 79 19 April 15 – 19 April Depicted on the Eadwine Psalter, with the remark that such 'hairy stars' appeared rarely, 'and then as a portent'. 1P/1222 R1, 1222 1222 77 10 September 10 – 28 September Described by Japanese astronomers as being 'as large as the half Moon . . . Its colour was white but its rays were red'. 1P/1301 R1, 1301 1301 79 22 October 22 – 31 October Seen by Giotto di Bondone and included in his painting The Adoration of the Magi. Chinese astronomers compared its brilliance to that of the first-magnitude star Procyon. 1P/1378 S1, 1378 1378 77 9 November 9 – 14 November Passed within 10 degrees of the north celestial pole, more northerly than at any time during the past 2000 years. This is the last appearance of the comet for which Oriental records are better than Western ones. 1P/1456 K1, 1456 1456 78 8 January 8 January – 9 June Observed in Italy by Paolo Toscanelli, who said its head was 'as large as the eye of an ox', with a tail 'fan-shaped like that of a peacock'. Arabs said the tail resembled a Turkish scimitar. Turkish forces attacked Belgrade. 1P/1531 P1, 1531 1531 75 26 August 26 August Seen by Peter Apian, who noted that its tail always pointed away from the Sun. This sighting was included in Halley's table. 1P/1607 S1, 1607 1607 76 27 October 27 October Seen by Johannes Kepler. This sighting was included in Halley's table. 1P/1682 Q1, 1682 1682 75 15 September 15 September Seen by Edmond Halley at Islington. 1P/1758 Y1, 1759 I 1758 76 13 March 13 March – 25 December Return predicted by Halley. First seen by Johann Palitzsch on 1758 December 25. 1P/1835 P1, 1835 III 1835 77 16 November August – 16 November First seen at the Vatican Observatory in August. Studied by John Herschel at the Cape of Good Hope. 1P/1909 R1, 1910 II, 1909c 1910 75 20 April 20 April – 20 May Photographed for the first time. Earth passed through the comet's tail on 20 May. 1P/1982 U1, 1986 III, 1982i 1986 76 9 February 9 February 0.586 AU Reached perihelion on 9 February, closest to Earth (63 million km) on 11 April. Nucleus photographed by the European space probe Giotto and the Russian probes Vega 1 and 2. 2061 75 28 July 28 July 2061 Next return of Halley's comet. ^ a b Donald K. Yeomans. "Horizon Online Ephemeris System". California Institute of Technology, Jet Propulsion Laboratory. Retrieved 8 September 2006. ^ a b c d e f "JPL Small-Body Database Browser: 1P/Halley" (11 January 1994 last obs). Jet Propulsion Laboratory. Retrieved 13 October 2008. 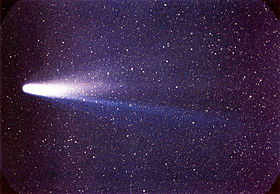 ^ a b c "What Have We Learned About Halley's Comet?". Astronomical Society of the Pacific (No. 6 – Fall 1986). 1986. Retrieved 16 December 2008. ^ a b G. Cevolani; G. Bortolotti; A. Hajduk (1987). "Halley, comet's mass loss and age". Il Nuovo Cimento C. Italian Physical Society. 10 (5): 587–591. Bibcode:1987NCimC..10..587C. doi:10.1007/BF02507255. ^ a b R. Z. Sagdeev; P. E. Elyasberg; V. I. Moroz. (1988). "Is the nucleus of Comet Halley a low density body?". Nature. 331 (6153): 240–242. Bibcode:1988Natur.331..240S. doi:10.1038/331240a0. ^ S. J. Peale (1989). "On the density of Halley's comet". Icarus. 82 (1): 36–49. Bibcode:1989Icar...82...36P. doi:10.1016/0019-1035(89)90021-3. densities obtained by this procedure are in reasonable agreement with intuitive expectations of densities near 1 g/cm3, the uncertainties in several parameters and assumptions expand the error bars so far as to make the constraints on the density uniformative ... suggestion that cometary nuclei tend to by very fluffy, ... should not yet be adopted as a paradigm of cometary physics. ^ S. J. Peale; J. J. Lissauer (1989). "Rotation of Halley's Comet". Icarus. 79 (2): 396–430. Bibcode:1989Icar...79..396P. doi:10.1016/0019-1035(89)90085-7. ^ R. R. Britt (29 November 2001). "Comet Borrelly Puzzle: Darkest Object in the Solar System". Space.com. Retrieved 16 December 2008. ^ a b c "New Image of Comet Halley in the Cold". European Southern Observatory. 1 September 2003. Retrieved 26 February 2018. ^ a b c d G. W. Kronk. "1P/Halley". cometography.com. Archived from the original on 23 November 2017. Retrieved 13 October 2008. ^ a b c d D. K. Yeomans; J. Rahe; R. S. Freitag (1986). "The History of Comet Halley". Journal of the Royal Astronomical Society of Canada. 80: 70. Bibcode:1986JRASC..80...62Y. ^ Yeomans, D. K.; Kiang, T. (1 December 1981). "The long-term motion of comet Halley". Monthly Notices of the Royal Astronomical Society. 197 (3): 633–646. Bibcode:1981MNRAS.197..633Y. doi:10.1093/mnras/197.3.633. ISSN 0035-8711. ^ O. Ajiki; R. Baalke. "Orbit Diagram (Java) of 1P/Halley". Jet Propulsion Laboratory Solar System Dynamics. Retrieved 1 August 2008. ^ a b c d e D. A. Mendis (1988). "A Postencounter view of comets". Annual Review of Astronomy and Astrophysics. 26 (1): 11–49. Bibcode:1988ARA&A..26...11M. doi:10.1146/annurev.aa.26.090188.000303. ^ a b c d e f g h H. U. Keller; D. Britt; B. J. Buratti; N. Thomas (2005). "In Situ Observations of Cometary Nuclei". In M. Festou; H. U. Keller; H. A. Weaver (eds.). Comets II (pdf). University of Arizona Press. pp. 211–222. ISBN 978-0-8165-2450-1. ^ "Halley". Merriam–Webster Online. Retrieved 21 December 2009. ^ "Saying Hallo to Halley". Retrieved 8 May 2015. ^ "New York Times Science Q&A". The New York Times. 14 May 1985. Retrieved 9 January 2011. ^ a b Ley, Willy (October 1967). "The Worst of All the Comets". For Your Information. Galaxy Science Fiction. pp. 96–105. ^ Yeomans DK, Rahe J, Freitag RS. The history of comet Halley. Journal of the Royal Astronomical Society of Canada 1986 Apr; 80 62–86; page 81. ^ a b c d D. W. Hughes; et al. (1987). "The History of Halley's Comet". Philosophical Transactions of the Royal Society A. 323 (1572): 349–367. Bibcode:1987RSPTA.323..349H. doi:10.1098/rsta.1987.0091. JSTOR 37959. ^ Brodetsky, S. "Astronomy in the Babylonian Talmud". Jewish Review. 1911: 60. ^ J. D. Rayner (1998). A Jewish Understanding of the World. Berghahn Books. pp. 108–111. ISBN 1-57181-973-8. ^ S. Nakano (2001). "OAA computing sectioncircular". Oriental Astronomical Association. Retrieved 15 May 2007. ^ "NEO Close-Approaches Between 1900 and 2200 (sorted by relative velocity)". NASA/JPL Near-Earth Object Program. Retrieved 5 February 2008. ^ "Meteor Streams". Jet Propulsion Laboratory. Retrieved 15 March 2007. ^ Umasankar Mitra (1987). "An Investigation Into the Association Between Eta-Aquarid Meteor Shower and Halley's Comet". Bulletin of the Astronomical Society of India. 15: 23. Bibcode:1987BASI...15...23M. ^ a b c A. Morbidelli (2005). "Origin and dynamical evolution of comets and their reservoirs". arXiv:astro-ph/0512256. ^ a b c d D. C. Jewitt (2002). "From Kuiper Belt Object to Cometary Nucleus: The Missing Ultrared Matter". The Astronomical Journal. 123 (2): 1039–49. Bibcode:2002AJ....123.1039J. doi:10.1086/338692. ^ B. Gladman; et al. (2009). "Discovery of the first retrograde transneptunian object". The Astrophysical Journal. 697 (2): L91–L94. Bibcode:2009ApJ...697L..91G. doi:10.1088/0004-637X/697/2/L91. ^ a b D. I. Olsson-Steel (1987). "The dynamical lifetime of comet P/Halley". Astronomy and Astrophysics. 187 (1–2): 909–912. Bibcode:1987A&A...187..909O. ^ Donald K. Yeomans (1991). Comets: A Chronological History of Observation, Science, Myth, and Folklore. Wiley and Sons. pp. 260–261. ISBN 0-471-61011-9. ^ B.V. Chirikov; V.V. Vecheslavov (1989). "Chaotic dynamics of comet Halley" (PDF). Astronomy and Astrophysics. 221: 146–154. Bibcode:1989A&A...221..146C. ^ J. Lages; D. Shepelyansky; I.I. Shevchenko (2018). "Kepler map". Scholarpedia. 13 (2): 33238. ^ Williams, Matt. "WHAT IS HALLEY'S COMET?". Universe today. ^ a b c d e f g J. C. Brandt. "McGraw−Hill AccessScience: Halley's Comet" (PDF). McGraw-Hill. Retrieved 27 November 2009. ^ a b M. Delehanty. "Comets, awesome celestial objects". AstronomyToday. Retrieved 15 March 2007. ^ J. Crovisier; T. Encrenaz (2000). Comet Science (pdf). Cambridge University Press. ISBN 978-0-521-64591-1. ^ "Giotto:Halley". esa. 2006. Retrieved 5 December 2009. ^ H. A. Weaver; et al. (1997). "The Activity and Size of the Nucleus of Comet Hale–Bopp (C/1995 O1)". Science. 275 (5308): 1900–1904. Bibcode:1997Sci...275.1900W. doi:10.1126/science.275.5308.1900. PMID 9072959. ^ "Voyages to Comets". NASA. 2005. Retrieved 5 December 2009. ^ Paul Rincon (10 September 2010). "Halley's comet 'was spotted by the ancient Greeks'". BBC News. ^ Donald K. Yeomans (1991). Comets: A Chronological History of Observation, Science, Myth, and Folklore. Wiley and Sons. p. 4. ISBN 0-471-61011-9. ^ a b G. Kronk (1999). Cometography, vol.1. Cambridge University Press. p. 14. ISBN 978-0-521-58504-0. ^ F. R. Stephenson; K. K. C. Yau; H. Hunger (1985). "Records of Halley's Comet on Babylonian tablets". Nature. 314 (6012): 587–592. Bibcode:1985Natur.314..587S. doi:10.1038/314587a0. ^ V. G. Gurzadyan; R. Vardanyan (4 August 2004). "Halley's Comet of 87 BC on the coins of Armenian king Tigranes?". Astronomy & Geophysics. 45 (4): 4.06. arXiv:physics/0405073. Bibcode:2004A&G....45d...6G. doi:10.1046/j.1468-4004.2003.45406.x. ^ a b c d e f g D. K. Yeomans (1998). "Great Comets in History". Jet Propulsion Laboratory. Retrieved 15 March 2007. ^ a b George F Chambers (1909). The Story of the Comets. Teh Clarenden Press. p. 123. ^ C. Humphreys (1995). "The Star of Bethlehem". Science and Christian Belief. 5: 83–101. ^ "The Talmud: Harioth Chapter III". SacredTexts.com. Retrieved 15 March 2007. ^ Y. Ne'eman (1983). "Astronomy in Israel: From Og's Circle to the Wise Observatory". Tel-Aviv University. Retrieved 15 March 2007. ^ G. Ravene (1897). "The appearance of Halley's Comet in AD 141". The Observatory. 20: 203–205. Bibcode:1897Obs....20..203R. ^ a b c R. J. Olson; J. M. Pasachoff (1986). "New information on Comet Halley as depicted by Giotto DI Bondone and other Western artists". In ESA, Proceedings of the 20th ESLAB Symposium on the Exploration of Halley's Comet. 3: 201–213. Bibcode:1986ESASP.250c.201O. ^ Thomas O'Toole (1985). "A Comet Lights the Imagination". The New York Times. Retrieved 13 September 2018. ^ a b "The Annals of Ulster AD 431–1201". Corpus of Electronic Texts. University College Cork. Retrieved 7 January 2010. ^ B. Brazil (18 September 2005). "Chaco Canyon mystery tour". The LA Times. Retrieved 15 March 2007. ^ G. Johnson (28 March 1997). "Comets Breed Fear, Fascination and Web Sites". The New York Times. Retrieved 27 September 2009. ^ Rerum Italicarum Scriptores, ed. Ludovico Antonio Muratori (Milan, 1730) v. 16 col. 770. ^ Gary Kronk, Cometography: A Catalogue of Comets: Volume 1, Ancient-1799 (Cambridge: University of Cambridge Press, 1999), pp. 253–255. ^ Emerson, Edwin. Comet lore, Halley's comet in history and astronomy. New York, Printed by the Schilling press. p. 74. Retrieved 1 October 2017. ^ C. M. Botley (1971). "The Legend of 1P/Halley 1456". The Observatory. 91: 125–126. Bibcode:1971Obs....91..125B. ^ Walter Slaje, Inter alia, realia: An Apparition of Halley's Comet in Kashmir. Observed by Śrīvara in AD 1456. In: Roland Steiner (ed. ), Highland Philology. Results of a Text-Related Kashmir Panel at the 31st DOT, Marburg 2010. (Studia Indologica Universitatis Halensis. 4). Halle 2012: 33–48. ^ The founding of Debre Berhan is described in the Royal Chronicles (Pankhurst, pp. 36–38). ^ Grier, David Alan (2005). "The First Anticipated Return: Halley's Comet 1758". When Computers Were Human. Princeton: Princeton University Press. pp. 11–25. ISBN 0-691-09157-9. ^ Ian Ridpath (1985). "Through the comet's tail". Revised extracts from A Comet Called Halley by Ian Ridpath, published by Cambridge University Press in 1985. Retrieved 19 June 2011. ^ Brian Nunnally (16 May 2011). "This Week in Science History: Halley's Comet". pfizer: ThinkScience Now. Archived from the original on 17 December 2012. Retrieved 19 June 2011. ^ "Yerkes Observatory Finds Cyanogen in Spectrum of Halley's Comet". The New York Times. 8 February 1910. Retrieved 15 November 2009. ^ a b Mark Strauss (November 2009). "Ten Notable Apocalypses That (Obviously) Didn't Happen". Smithsonian. Retrieved 14 November 2009. ^ "Interesting Facts About Comets". Universe Today. 2009. Retrieved 15 January 2009. ^ ‘From Drury Lane to Mecca. Being an account of the strange life and adventures of Hedley Churchward’ (Sampson Low, London, 1931). ^ Albert Bigelow Paine (1912). Mark Twain, a biography: the personal and literary life of Samuel Langhorne Clemens. Harper & Brothers. p. 1511. ^ "Mark Twain's birthday". Smithsonian Libraries. Archived from the original on 11 June 2010. Retrieved 16 December 2009. ^ Chautauquan (1910). "The Death of Mark Twain". The University of Virginia Library. Retrieved 16 December 2009. ^ J. Bortle (13 January 2010). "The Great Daylight Comet of 1910". Sky & Telescope Magazine. Retrieved 15 January 2010. ^ J. Bortle (W. R. Brooks Observatory) (1998). "The Bright Comet Chronicles". International Comet Quarterly. Retrieved 24 October 2010. ^ R. P. Broughton (1979). "The visibility of Halley's comet". Journal of the Royal Astronomical Society of Canada. 73: 24–36. Bibcode:1979JRASC..73...24B. ^ "Comet Halley Summary". Jet Propulsion Laboratory. 1985. Retrieved 11 July 2011. ^ "Australian Astronomy: Comets" (PDF). Australian Astronomical Association. 2004. Archived from the original (PDF) on 16 June 2005. Retrieved 2 December 2009. ^ "Last Chance For Good Comet-Viewing". Ocala Star-Banner. 1 April 1986. p. 14. Retrieved 2 December 2009. ^ "Comet Halley Recovered". European Space Agency. 2006. Retrieved 16 January 2010. ^ "First Naked-Eye Sighting of Halley's Comet Reported". New York Times. 12 November 1985. Retrieved 21 July 2010. ^ "Suisei". Japan Aerospace Exploration Agency. 2008. Archived from the original on 14 January 2013. Retrieved 2 December 2009. ^ A. A. Boyarchuk; V. P. Grinin; A. M. Zvereva; P. P. Petrov; A. I. Sheikhet (1986). "A model for the coma of Comet Halley, based on the Astron ultraviolet spectrophotometry". Soviet Astronomy Letters (in Russian). 12: 291–296. Bibcode:1986PAZh...12..696B. ^ P. Murdin (2000). "International Cometary Explorer (ICE)". Encyclopedia of Astronomy and Astrophysics. Institute of Physics Publishing. Bibcode:2000eaa..bookE4650.. doi:10.1888/0333750888/4650. ISBN 0-333-75088-8. ^ "STS-51L". NASA Kennedy Space Center. Retrieved 7 January 2010. ^ "Spartan 203 (Spartan Halley, HCED)". space.skyrocket.de. Retrieved 6 September 2011. ^ D. J. Shayler; C. Burgess (2007). "Ending of Eras". NASA's Scientist-Astronauts. Praxis. pp. 431–476. ISBN 0-387-21897-1. Retrieved 7 January 2009. ^ "STS-35 (38)". NASA. Retrieved 7 January 2010. ^ D. Prialnik; A. Bar-Nun (1992). "Crystallization of amorphous ice as the cause of Comet P/Halley's outburst at 14 AU". Astronomy and Astrophysics. 258 (2): L9–L12. Bibcode:1992A&A...258L...9P. ^ a b S. Odenwald. "When will Halley's Comet return?". NASA. Archived from the original on 20 August 2011. Retrieved 29 November 2009. ^ a b "JPL Close-Approach Data: 1P/Halley" (11 January 1994 last obs). Jet Propulsion Laboratory. Retrieved 5 May 2009. ^ "Comet names and designations". International Comet Quarterly. Retrieved 20 January 2011. ^ Richard M. Schmude (2010). Comets and How to Observe Them. Springer. p. 3. ISBN 978-1-4419-5790-0. ^ B. G. Marsden; G. V. Williams (1996). "Catalogue of Cometary Orbits 1996. 11th edition". Catalogue of Cometary Orbits. International Astronomical Union. Bibcode:1996cco..book.....M.
^ J. L. Brady (1982). "Halley's Comet AD 1986 to 2647 BC". Journal of the British Astronomical Association. Lawrence Livermore Laboratory, University of California. 92: 209. Bibcode:1982JBAA...92..209B. ^ The poet Kurunkozhiyur Kizhaar and Koodaloor Kizhaar who were present at the death of the king state that the death was portended by a falling star (possibly a comet) seven days previous to the occurrence. Gore, Rick (December 1986). "Halley's Comet '86". National Geographic. Vol. 170 no. 6. pp. 758–785. ISSN 0027-9358. OCLC 643483454. P. Lancaster-Brown (1985). Halley & His Comet. Blandford Press. ISBN 0-7137-1447-6. C. Sagan; A. Druyan (1985). Comet. Random House. ISBN 0-394-54908-2. Joseph Needham (1959). "Comets, meteors, and meteorites". Science and Civilisation in China: Volume 3, Mathematics and the Sciences of the Heavens and the Earth. Cambridge University Press. pp. 430–433. ISBN 978-0-521-05801-8. Wikimedia Commons has media related to Comet Halley. Donald Yeomans, "Great Comets in History"